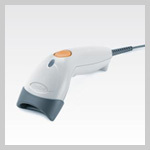 Barcode readers or barcode scanners are electronic devices for reading printed barcodes. Over the years, barcode readers have evolved from linear or one-dimensional into rectangles, dots, hexagons and other geometric patterns in two dimensions (2D). Barcode scanning has in fact changed the way people shop, stock or ship. Today barcode scanning lenses are adaptable through scanners and interpretive software on wider range of devices including desktop printers and smartphones. Scan Infotech is a leading supplier of Industrial grade Barcode Scanners, Hands free Scanners, Handheld terminals, RFID based devices, and Mobile Computers. We also specialize in providing corporate and industrial verticals with a variety of business process solutions in India and globally.